We use a radiofrequency technology (RF) to tighten skin and contour the face and body as part of the Syneron Candela Sublime Treatment. This is relatively new technology and works by heating the deeper layers of the skin that provide the ‘scaffolding’ for skin tone. Collagen formation is stimulated which effectively tightens the skin, reducing sagging, wrinkles and creating contours. This treatment is ideal for clients who have mild to moderate wrinkles, sagging skin, and loss of skin tone. The best areas that respond to RF are around the eyes, cheeks, neck and around the mouth area (nasolabial folds). It is used to treat conditions such as ‘jowling’. 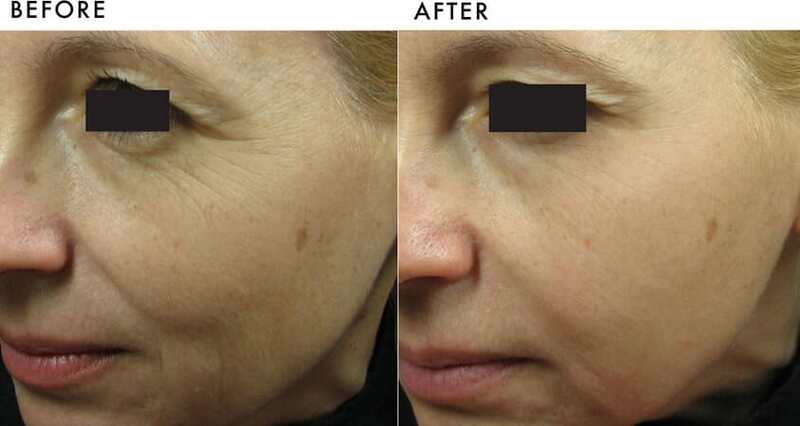 This treatment can also be used as a preventative treatment for skin wrinkling and sagging during the early stages of ageing.This treatment can be combined with other laser rejuvenation treatments such as fractional RF resurfacing or CO2 laser resurfacing treatments for a more complete facial rejuventation. RF skin tightening and contouring is a non-invasive treatment and there is no downtime associated with this procedure. Side effects may include prolonged erythema (redness) for 1-2 days, discolouration of the treated area and superficial blistering of the skin but these are not common and will resolve in a few days. Any area can be treated but the recommended areas for this treatment are the cheeks, neck, around the mouth and eyes where sagging and wrinkling generally occur. Although you will likely see some improvement in your skin after your first treatment, most people see gradual and cumulative improvement over the course of 3-5 treatments with 4-6 weeks between treatments. This treatment can also be used as a preventative treatment for skin wrinkling and sagging during the early stages of ageing where ongoing treatments every 4-6 weeks is recommended. Please refer to our treatment menu. Discounts apply when multiple treatments are purchased or when purchasing multiple treatment areas. RF skin tightening and contouring can be combined with other skin rejuvenation treatments such as photorejuvenation and fractional RF resurfacing. We offer the ‘Trinity’ which is a customised package offering all three treatments. Talk to your therapist regarding your areas of concern and they will advise you of your treatment options.